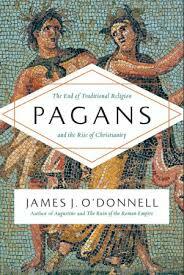 "Pagans: The End of Traditional Religion and the Rise of Christianity" By James J. O'Donnell (2015). For hundreds of years, religious and spiritual pluralism thrived in the Roman Empire. In the fourth century, however, as Christianity became the state religion, Christians developed the concept of the “pagan” to stigmatize and ostracize those who refused to devote themselves to the Christian god. These pagans were Greeks, Romans, Gauls, and Syrians who chose to piously observe the traditions of their ancestors. Pagans uncovers how the ancient and deeply rooted religious traditions of these polytheistic Romans were undermined and suppressed by the rise of Christianity in little more than a hundred years. James J. O’Donnell explores the foundational features of Roman religion and culture, paints fresh portraits of iconic historical figures—including Constantine, Julian, and Augustine—and breathes new life into the defining tensions of the era: Rome versus the East, civilization versus barbarism, plurality versus unity, rich versus poor, and tradition versus innovation. In this nuanced account of religious repression, O’Donnell offers an iconoclastic history of religion that tells an exciting new story that is deeply relevant to the way we think about religion in our own time. It's impossible to discuss belief in a higher power without understanding the meaning of the word "god." In this video, Georgetown University Provost James J. O'Donnell takes us through the history and evolution of the gods, using examples from antiquity through the Middle Ages, all the while incorporating analogies and examples from modern life in the West. James O'Donnell has been a professor of classics and provost at Georgetown University since 2003. Before that he taught for 21 years at the University of Pennsylvania and held visiting appointments at Johns Hopkins University, the University of Washington, and Yale University. He is a classicist who specializes in the history and culture of the Roman world from 100 BCE to 600 CE. He also has written and spoken widely on the cultural consequences of information technologies, both ancient and modern. His most recent books are Avatars of the Word: From Papyrus to Cyberspace (Harvard University Press, 1998), Augustine: A New Biography (Harper Collins, 2005), and The Ruin of the Roman Empire (Ecco Press, 2008). He is finishing a volume entitled Pagans and looks beyond that to a study of Cicero intended to explore the links between ancient figures and texts and their modern readers and students. Past president of the American Philological Association and a fellow of the Medieval Academy of America, he is a member of the board of trustees of the American Council of Learned Societies and previously served on the board of the National Humanities Center.